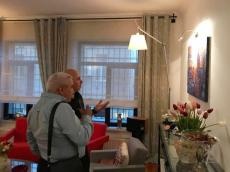 A final part of the exhibition of the project "The Netherlands through Azerbaijani Eyes" was held at the residence of the Ambassador of the Netherlands in Azerbaijan Onno Kervers. Thirteen very talented artists presented wonderful paintings inspired by the Netherlands, Trend Life reported. This extraordinarily diverse country features lush, green countryside, wild shorelines, medieval towns built on canals and modern cities filled with skyscrapers. The capital of the Netherlands, Amsterdam is a place of contrasts, a contemporary, laid back city filled with unique and historical sites. The birthplace of Vincent van Gogh and Hieronymus Bosch is still striking in its ancient and modern architecture, and undoubtedly can serve as a source of inspiration. The exhibition was attended by representatives of diplomatic missions accredited in Azerbaijan, famous figures of culture and art, representatives of creative youth. Addressing the event, Dutch Ambassador to Azerbaijan Onno Kervers expressed gratitude to the artists. The diplomat added that the artists managed to reveal the given theme, and the works turned out to be interesting and diverse. It was stressed that the artists painted their paintings in the Art Tower. And the project itself promotes the expansion of relations in the sphere of culture and art between the two countries. The head of NGO Arts Council Azerbaijan artist Dadash Mammadov said that 13 works of art were created within the framework of the project. Through their works, artists brilliantly conveyed their impression and internal vision of this amazing country. The Head of the NGO Arts Council Azerbaijan thanked the Embassy of the Netherlands in Azerbaijan for supporting the project and activities of the Arts Council Azerbaijan, adding that the project is of great interest, and cooperation with other countries will further continue. Guests of the event got acquainted with the exposition. Each painting took the viewers on a journey through this beautiful country.